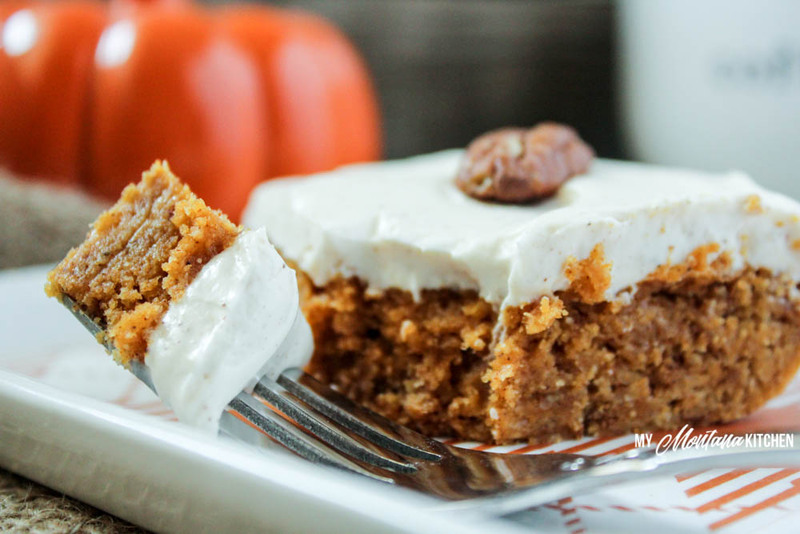 Sweet, dense pumpkin bars topped with a decadent cinnamon spiced cream cheese frosting. This recipe is low carb, sugar free, and a Trim Healthy Mama S Recipe. Ah, pumpkin spice. I am one of those people that loves pumpkin enough to eat it all year long. But for some reason many people have relegated pumpkin to the Autumn season. I’m sure it is because that is when pumpkins are harvested. But, thanks to canned pumpkin, I can still enjoy my pumpkin treats all year long. Even I admit, though, that my pumpkin cravings kick up a notch when we edge towards fall. I was going to say “when the weather turns cooler,” but in Montana, it is pretty much cool every morning. Even when it gets to 95 degrees during the day, it will usually cool off to at least 60 overnight. One of the many joys of living in the Rocky Mountains! I love it! 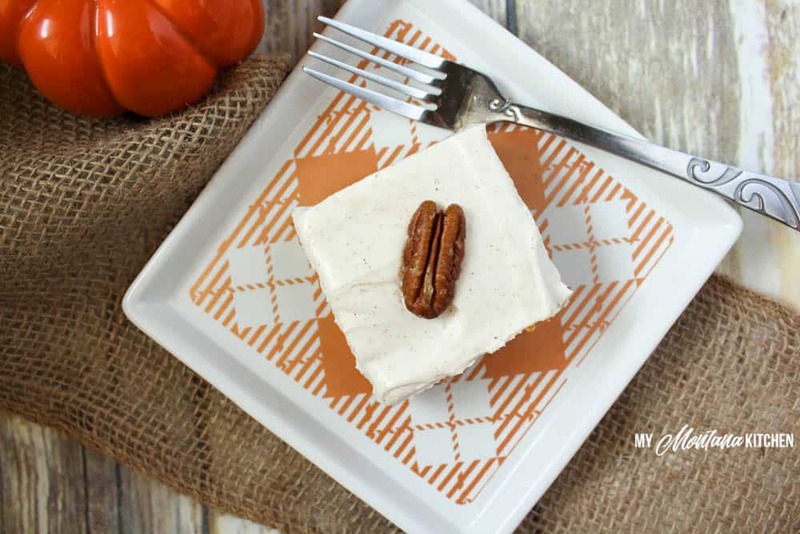 But back to the recipe at hand – these wonderful Pumpkin Bars with Cinnamon Cream Cheese Frosting. These bars passed a teenage (dorm) son test, and the test of my (almost) 10 year old and 8 year old. That alone should tell you something! If you are not big on spice, you can omit the cinnamon from the cream cheese frosting, but I think it gives it a nice touch. Also, if you do not have Baking Blend, you can use an equal blend of almond flour, flax meal, and coconut flour. And if you do not have Gentle Sweet, you can use your favorite powdered sweetener, or use half the amount of Pyure (available at most Walmarts). So, what do you need for these delicious bars? See notes above for substitutions. Spread frosting onto cooled bars. Place in the refrigerator for 1 hour to help frosting to "set." Top each piece with 1 pecan half, if desired. Mine is in the oven, smells yummy! Doubled it to take some to potluck Bible study this weekend. First pumpkin treat since adding grain free/sugar free to my gluten free way of eating. Miss my pumkin bread (IT’S CAKE, REALLY!). The real question is if I can keep from eating the icing before the bars cool, lol! Thanks for the recipe!!!!!!! These were delicious. But how can this be an S when it has 15g of fat and 15g of carbs? Wouldn’t that be a XO? I’m new to THM. Just curious. Thanks for the recipe! These look amazing! I do not have any Baking Blend but see that baking blend is specially formulated with oat fiber, almond and coconut flour. I do have these 3 ingredients though. Do you know the amounts of each that would make up the correct formula? Thank you! These were AMAZING! I actually ate 2 servings for breakfast. 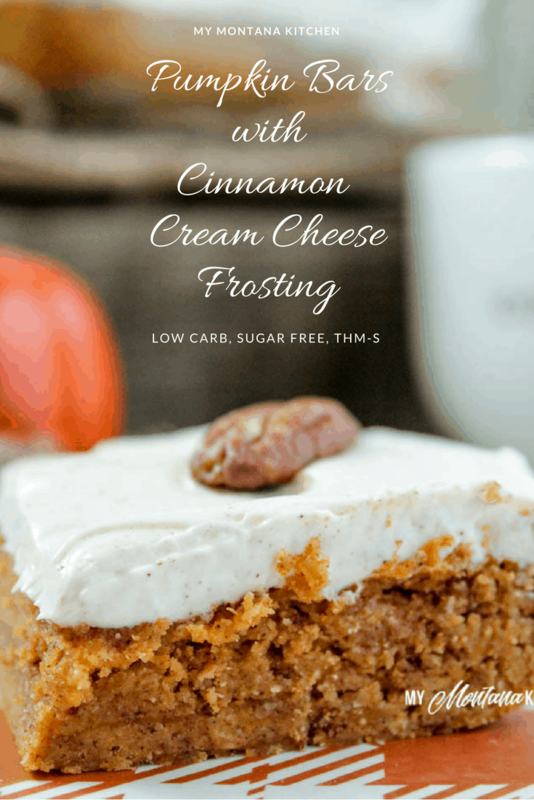 The cream cheese frosting is addictive!! I will be making these again! Thank you for the recipe. Wonderful!!! I’m so thrilled that you enjoyed them!! These are amazing! They are perfect for breakfast. Do you think coconut flour vs. baking blend would be ok? Hi, These look great. I’m sharing a link to your recipe on my blog Friday September 22, 2017. If you’d like me to remove it, I will be happy to. Please either email me or leave a comment on the blog post. It’s called “Digging Into the Archives”. 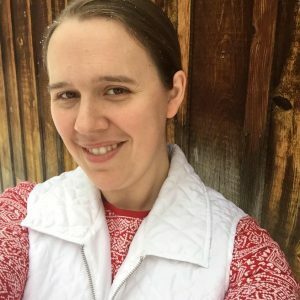 I am recovering from chemotherapy, so instead of writing my regular Friday feature, I’m sharing some of my old blog posts and linking to a couple recipes that look yummy including yours. Thanks so much for sharing this. I look forward to trying them. If you don’t have baking blend can you use Carbquik? I have never used Carbquick, so I cannot give a definite answer. Baking Blend has oat fiber and coconut flour, which are both very thirsty. You may need to adjust the eggs/liquid ratio. There are different sizes of canned pumpkin, please tell me the size can you are using. Thanks. Mine was not done in 20 mins… I had to cook it several more minutes,! What did I do wrong ?? Can you use honey or maple as the sweetener for this? I would think so, but I would not know the amounts. These are SO good! I made two batches and then doubled the recipe and made another batch My husband even liked them! Thank you! They save me when I come home from work late. Is there a gentle sweet substitute? How much pyure would I use for a sweetener? When using Pyure in place of Gentle Sweet, I usually use half the amount. Delicious! I love the dense texture. I only had 1/2 the amount of ingredients for the frosting, but the thinner layer of frosting was still enough. I made these, I did have to cook longer than 20 min. But they are delicious. I forced my husband to taste and he said hey these aren’t bad, does it have all that funny stuff in them? I said yes honey it does. He said not bad…he hates all the sweets I make. But this was a hit. Now to go hide them. These taste ever so naughty!!! It cures the craving for my mom’s pumpkin bars (which are amazing, but full of sugar). I doubled the recipe and made a double layer. I also subbed part of the cream cheese for Greek yogurt, and it was really good. 🙂 my mom gave these bars a thumbs up as well. Thank you for the recipe! These are excellent. I made one batch as is, and they were super. The second batch, I doubled the recipe and added unsweetened coconut and walnuts to the batter before baking. Also very good. And that icing…..wow…fantastic. Thank you for a great go-to fall recipe. This is definitely a keeper and will probably be on the Thanksgiving menu. So glad you liked it! Love the additions! Has anyone tried it with 1/3 fat cream cheese? I have not, but I think it would work just fine. I am not sure yet, if I will tell the secret to this awesome recipe. Some things are meant to be kept secret. Awe, thank you so much for sharing! I am so glad it passed the test – and I hope it was a hit!